Are you searching for a relaxing place to go in the afternoon; perhaps somewhere you could sit down with a cup of tea and simply have some time away from the never-ending city? 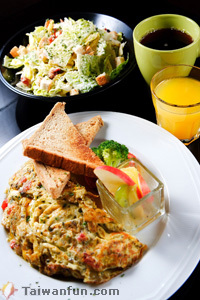 Pasta & Brunch Cafe is located in Taipei's busy East District, right inside SOGO Department Store. The name of this place, which means "hide" in Chinese, is fitting, since you can easily miss it if you're walking too fast. But, if you make a note of the peaceful courtyard and huge umbrellas, then you'll be quite glad to "hide" away there. Pasta & Brunch Cafe was previously known as Les Amis Restaurant. After 7:30 p.m., this trendy joint turns into a lounge bar. Since the restaurant is designed with private box dining rooms, the lounge section and the restaurant section are decorated differently and cater to different crowds. The chef came here after years of experience working for Grandma Nitti's Kitchen, a famous Chinese and western restaurant located on ShiDa Road. As time goes by, he learned how to make authentic handmade pastas from the Italian chefs at Rialto Osteria. And now, he is the man behind the kitchen at Pasta & Brunch. 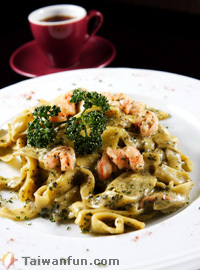 The restaurant offers a good selection of pasta dishes; try the Homemade Fettuccine with Shrimp in Creamy Pesto Sauce (NT$180）or the Homemade Fettuccine with Mixed Mushrooms in Creamy Pesto Sauce (NT$180), they are two of the most popular dishes here. Their pesto sauce also has a secret kick to it; unlike traditional pesto, which is made with pine nuts that can be a bit bitter, Pasta & Brunch cafe makes their sauce with crushed almonds. If you want to add on a soup or a drink to your entree, either are available for an extra NT$60. As far as brunch choices go, the restaurant has an array of omelets like their signature Grandma's Omelet (NT$280), or the Italian Omelet (NT$300); they both come with juice and coffee. On sunny afternoons, coming to Pasta & Brunch to relax is like a mini-getaway from the big city. Don't forget to book an outdoor seat to enjoy some sunshine. Apart from real meals, they also serve afternoon tea snacks and desserts (NT$160).